1. Why the name Vanguard? The word Vanguard embodies the concept of ‘leaders of an action or movement’, or the ‘front line of a fighting force that is moving forward’. Likewise, the Vanguard product is the industry’s first WirelessHART gas detector with 5+ years of battery life, providing undisputed innovative technology. 2. What problem does the Vanguard solve? Coverage: wired gas detectors limit the amount of coverage provided due to the high cost of wiring. Vanguard is a true wireless device with mount-in-anywhere mobility. Battery Life: existing wireless gas detectors have limited battery life <2 years. Vanguard has at least 5 years battery life based on an 8-second update rate. Communication: existing wireless gas detectors are not HART enabled and over 90% of installed open protocol wireless gateways use the WirelessHART protocol. Vanguard is the first WirelessHART gas detector. Easy to Test: most gas detectors are difficult to field calibrate and test. Vanguard is bump tested and calibrated through the push of only one button. Flexible Sensors: many gas detectors must be reconfigured when a new sensor is attached to the base unit to sense different gases. Vanguard uses a plug-and-play sensor architecture where different sensors can be plugged into the base transmitter and self-configuration occurs. Note: only one sensor can be plugged into the base at any one time. 3. What are the key features of the Vanguard? 4. Is the Vanguard difficult to install and commission? No, the Vanguard operates on a WirelessHART network designed by industry for industry, for simple and secure operation. Commissioning the Vanguard requires a NetID and Join Key. UE also offers free 14-day rentals of Vanguard Configurator Units for customers without a 475 HART communicator or HART modem to commission their units onto a network. The Configurator is touch screen and easy to use. 5. What are some industries and applications that the Vanguard has been used in? Take a look at some of the application stories where the Vanguard was able to save customers time and money. 6. What Vanguard accessories are currently offered? Replacement FLEXsenseTM toxic and combustible sensors as well as a calibration kit with regulator are available. Additionally, customers may choose from among three different mounting options: FLEXmountTM Standard, FLEXmountTM Magnet, or FLEXmountTM Universal. These options may also be ordered as an additional accessory. 7. Is the Vanguard an acceptable addition to my Fire & Gas system? Yes, NFPA 72 Section 26.16 specifies requirements for low power wireless sensors. Using the data available from the Vanguard, as well as programming in certain alarms in the Industrial Control System, one can meet the requirements of the NFPA standard. 8. What are the supported update rates in the Vanguard? 8, 16, 32, 64 seconds or 65s – 3600s. 9. What is the impact of weather on WirelessHART networks? WiHART networks are minimally impacted by weather events such as heavy rainfall, dense fog, snow and sandstorms. One factor affecting signal strength is the size of particles in the air to the wavelength of the wireless signal which could cause signal attenuation (i.e. reduction). Networks using the 2.4 GHz frequency band have a wavelength of 4.9in (12.5cm). Raindrops have a size of between 0.02 to 0.33 in (0.05 to 0.8 cm). Empirical data shows that even during heavy rainstorms of 6 in/hr (15.2 cm/hr), only minor attenuation of 0.05 dB/mile (0.08 dB/km) is seen on a 2.4 GHz wireless signal. Because of this, rain will have no impact on reliability and distance of a properly planned and installed Smart Wireless network. The size of water droplets in fog are significantly smaller than raindrops, ranging from 10 to 1000 times smaller. Because of this, the impact on 2.4 GHz systems is much less for fog than rain. Data shows that the attenuation of dense fog is in the range of 0.01 dB/mile (0.016 dB/km). This is well below the attenuation impact that will be noticeable in well-designed Smart Wireless networks installed according to best practices. Due to the larger size of snowflakes compared to raindrops, attenuation due to snow is generally higher than that of rain. A heavy snowfall can cause up to 0.1dB/mile (0.16 dB/km) attenuation of a 2.4 GHz system. 10. How many WirelessHART networks are there in the world? There are at least 32000+ WirelessHART networks estimated globally. An estimated 40% of WirelessHART networks are in North America and 60% are rest of world. 11. Can one tell the reliability of the network from the Vanguard? No. The Vanguard is just a device node in the network. However, that information could be taken from the gateway interface. The following are screen shots on the gateway interface where one would look to assess reliability and availability parameters. 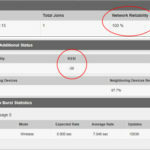 Network Reliability: A measure of connectivity between the gateway and wireless field device. Calculated as the ratio of the number of received messages over the number of expected messagestaking into account all paths. Path stability (or Hop Stability): A measure of connectivity between two devices in the wireless network. Calculated as the ratio of the number of received messages over the number expected. Received Signal Strength Indication (RSSI): receive signal strength indication in dBm of the wireless field device. 12. Does UE offer components for WirelessHART networks? Yes, UE offers WirelessHART gateways, repeaters, and adapters from Pepperl+Fuchs. For a new user, one can order all they need to build their network from UE. Solve with a UE Wireless Solution! 13. What is the recommended battery voltage for low battery alarm? We recommend 6V as the threshold for alarm. At this 6V level, the battery will degrade but still with sufficient time to change out before it dies completely. 14. Can you, and how do you annunciate low battery voltage? Yes, by bursting command 48 and looking at byte #6 (critical power failure) or byte #8 (power supply conditions out of range). In addition, byte #6 critical power failure sets the power low module display on the gateway web page under published data (see below). 15. What is the functionality of the push button? Screen View: to toggle between the home screen and concentration screen on the device. The home screen is the primary screen mode. Calibration: to activate the calibration sequence during device calibration. To enter calibration mode, the push button must be pressed and held for approximately 10 seconds. HART Terminals: to activate the wired HART terminals when connected to a HART modem. The modem goes back into low power mode if there is no activity detected. This explains the time out during the wired connection. 16. What are the four variables the Vanguard transmits? Do we support any other variables? We only support these four variables at the moment. 17. How do I setup the burst commands for the Vanguard? By default, burst message 0 is set to command 9. We recommend busting Command 48 to get more diagnostics reported to the gateway. 18. What is the lead-time on the Vanguard? Lead-time is currently 2 weeks for orders up to 50 units. Please contact Customer Service at +1 617 923-6944 for lead-times on quantities greater than 50. 19. What is the warranty on the Vanguard? 20. What is inside the box of a shipped unit? When a complete assembly is ordered, the package will contain a base transmitter, a sensor boxed separately, and a mounting bracket kit boxed separately. The lithium battery pack is shipped in a different package per US and International Transport Authorities (e.g., IATA). 21. Are the lithium batteries returnable? No. Please follow proper hazardous waste disposal procedures for lithium batteries per your organization and/or local regulations. 22. Where can I find more information on the Vanguard? There is a dedicated product page within the UE website (https://www.ueonline.com/products/wirelesshart-gas-detector/) hosting the necessary resources related to the product and how to install/operate it. The device descriptions are also downloadable from this page. 23. Who should I contact for further assistance? Please contact Kirk Dragsbaek, or one of our other UE Sales Engineers for inquiries and technical help.